Submitted by Quest-News-Serv... on Tue, 03/11/2014 - 22:35. POLAND TWP., Ohio - Four earthquakes shook parts of the valley Monday morning. 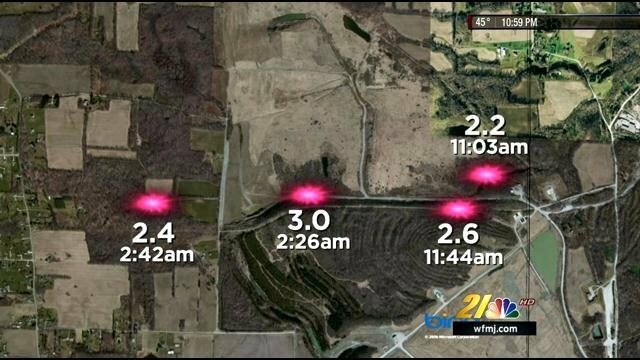 All of the tremors were centered in Poland Township. The Lamont-Doherty Cooperative Seismographic Network reports a 3.0 magnitude earthquake close to 2:30 a.m. Monday, just east of the Poland Township Park. A second tremor, a 2.4 magnitude, was recorded 16 minutes later on the west side of the park. Shortly after 11 a.m., a third 2.2 magnitude earthquake was registered north of Cowden Road in the area of the Carbon Limestone Landfill. About forty minutes later, the center of a 2.6 magnitude quake was reported close to the last tremor. The 3.0 magnitude earthquake was strong enough to wake up some homeowners in Poland Township early Monday morning. One Poland resident tells 21 News that he was awake at home when the 3.0 earthquake rattled his house. "The whole house shook out of nowhere, it was very surprising," said Alex Deperro of Poland. Deperro says he noticed what seemed like a possible aftershock just before lunchtime. The Ohio Department of Natural Resources released a statement Monday afternoon that its experts confirmed seismic activity in the township, near Hilcorp Energy's wells. "All available information indicates the events are not connected to Class II injection activities," Mark Bruce says, ODNR public information officer. "Out of an abundance of caution we notified the only oil and gas operator in the area, and ordered them to halt all operations until further assessment can take place. ODNR is using all available resources to determine the exact circumstances surrounding this event and will take the appropriate actions necessary to protect public health and safety." Hilcorp Energy Company says it's working with the state to investigate the latest seismic activity near its wells. The company says "it is far too early in the process to know exactly what happened and we're not aware of any evidence to connect our operations to these events." Hilcorp plans to suspend all activity near the site. ODNR says experts are now in the process of analyzing the data. A local professor says all possible triggers should be taken into consideration when the state analyzes the earthquake data. "Those are in proximity to a place where they've been fracking for shale gas, so that doesn't prove anything, but there's a correlation in time, there's a correlation in space, so that's a testable hypothesis," Dr. Ray Beiersdorfer says, geology professor at Youngstown State University.